If I were to use one word to describe this game, it’d be “rage”. I spent a large amount of time replaying and replaying levels due to my constant deaths. The game is difficult, really, but it’s an amazing experience. The game started with a very simple story. Badguy shows up, badguy steals goods, goodguy must return the goods. It’s primitive, yes, and not really unnecessary, but it lays the foundation for how the hero goes about getting the goods back. The controls are very simple, with new abilities introduced over time, allowing plenty of time to get used to each ability and its corresponding button. I never found myself mixing up the controls. You end up having access to four different attacks, each with its own advantages. Some of the major attacks have other major uses, like jumping higher, or swinging across the level. 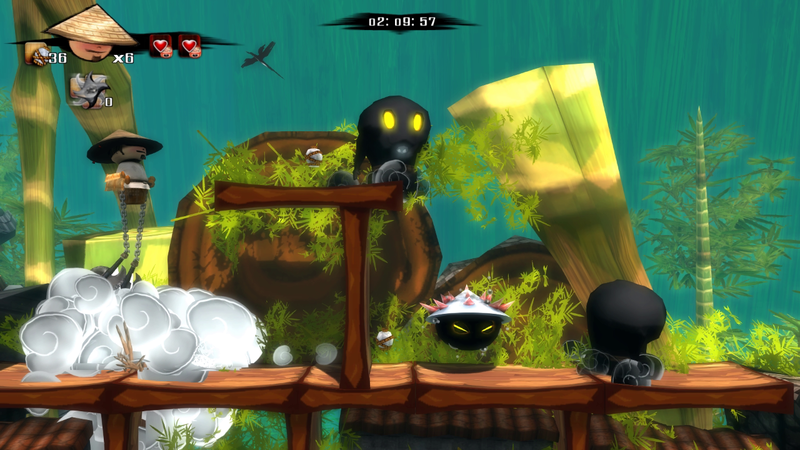 There are a variety of enemies scattered throughout the nine levels of the game. I wasn’t sure if each dealt a different amount of damage, but later in the game, it certainly felt like I was taking more damage by the new enemies being introduced, some even killing me in a single hit. The enemies and obstacles both progressed in difficulty over the course of the game and this was a reasonable pace, up until the final level. The final level was excruciating to complete. That level contained the final boss, who I actually defeated on my second try, but the segment leading up to the final boss was just painful. I died many times in an effort to complete that level. It seemed as if they took the difficulty of the rest of the game and squared it. 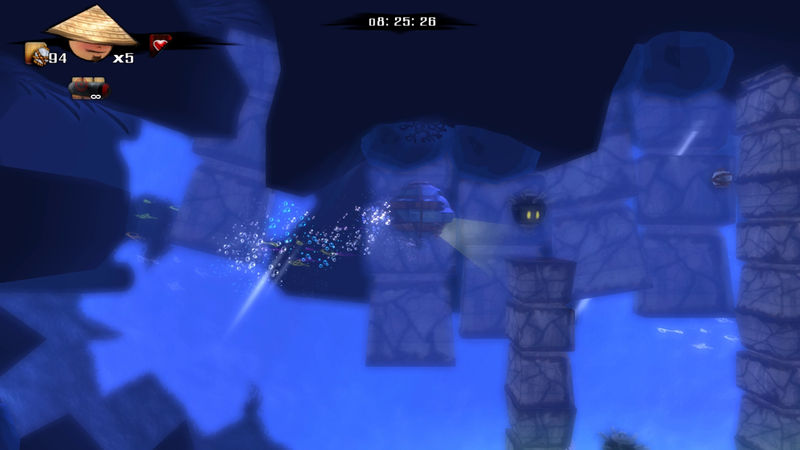 Wooden Sen’SeY also featured a water level in which the protagonist traversed an underwater cave in a spherical submarine. This added a bit of variety to the gameplay, but I did not find this level as enjoyable as the normal, land-based levels. The level was a bit annoying at times too, especially near the end, when I had to find my way through a maze of wooden crates infested by enemies. The game’s graphics were simply stunning. When placed on their highest settings, it was just.. amazing. The style chosen for the landscape, characters, and textures blended well with the platforming genre as a whole. The character models reminded me of Double Fine’s “Stacking”, but in a more “cartoon” way. The game’s music was also great, and makes me wonder if there is a soundtrack available? 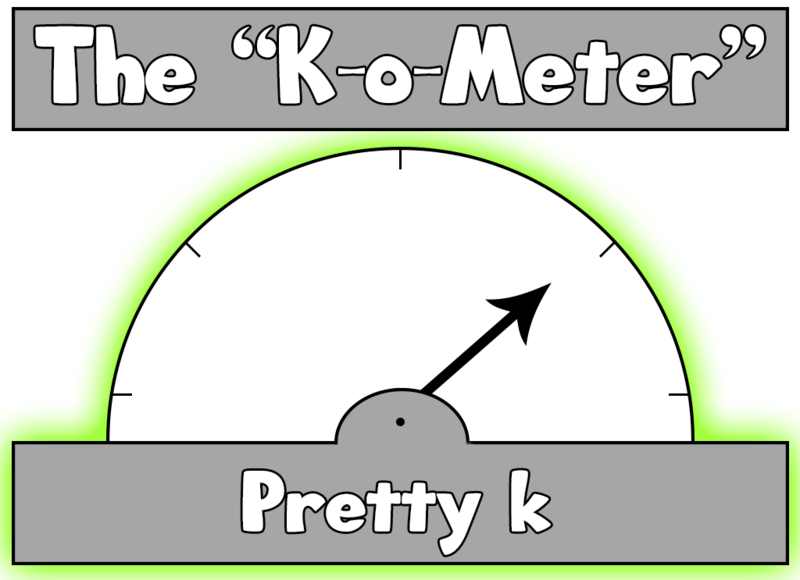 Wooden Sen’SeY’s primary fault is the length of the game. It took me roughly two hours to beat. That’s nowhere near the amount that I wanted, but it was an enjoyable two hours nonetheless. 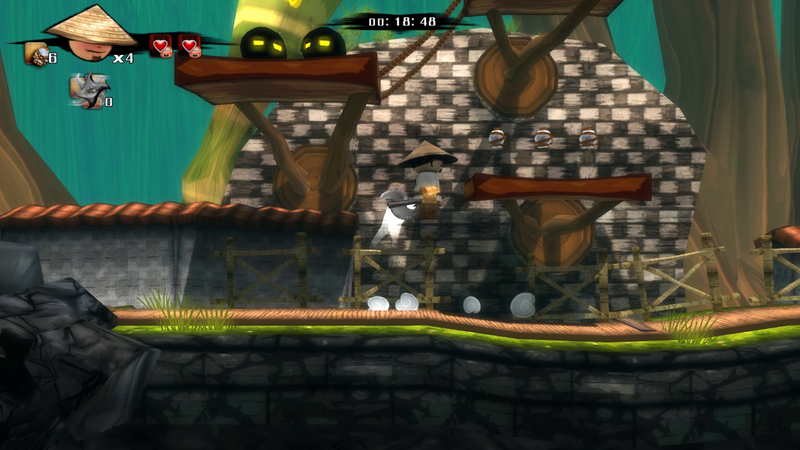 Wooden Sen’SeY also has a time attack mode, which consists of 30 small stages that truly test your platforming skills. I still find myself stuck on a single one, because I cannot pass it fast enough, but this mode does add some extra length to the game. It reminded me of Rayman’s time attack modes, on a smaller scale. These stages are surprisingly difficult, and I found myself stuck on certain stages for upwards of ten minutes. I’m still stuck on an early level, but they are fairly entertaining and I recommend playing them after beating the story mode. Overall, Wooden Sen’SeY was an excellent experience. Fun, challenging gameplay bundled with amazing graphics. I cannot wait to see what Upper Byte Studio brings us next.